Ah yes, the paint job. This is the part of the plane that everyone sees first. 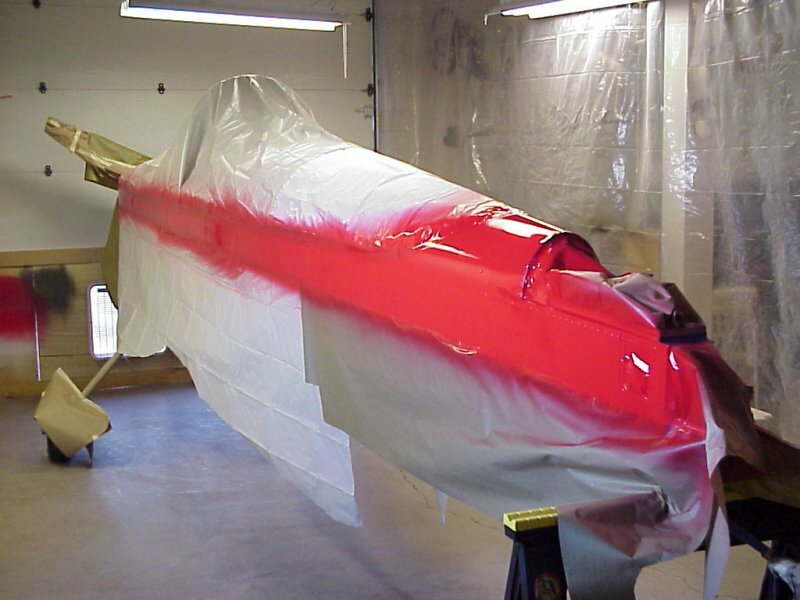 You can have a masterpiece of construction, but put a shoddy paint job on it and your fellow aviators will judge your plane as a "homebuilt beater". Nevertheless, I have always wanted to learn how to paint myself. 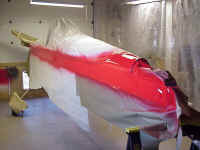 I would also like to be able to make my own repairs and changes without having to be dependent upon a paint shop. The paint job is where you can save a huge chunk of $ if you're willing to do it yourself. For all these reasons I have committed to tackling the task myself. Making a decision on a paint scheme was a struggle. All of my other decisions on the plane, including panel layout, were fairly easy and made well ahead. Even though I contemplated paint schemes since the very beginning, I couldn't seem to lock in on one — not my typical pattern. 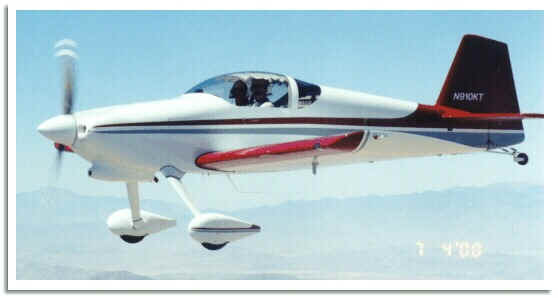 Finally I narrowed it down to two basic options that I will call "Extra 300 knockoff" and "Modified traditional RV-4". 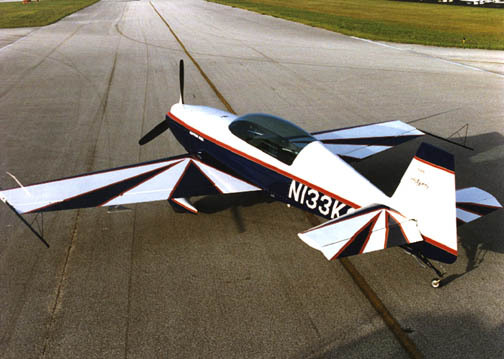 My other choice is an adaptation of what has evolved as the traditional RV-4 paint scheme, but modified with a solid color vertical and horizontal stabilizers. The RV-8 tail is taller, with a different shape than an RV-4 and I think it looks a bit awkward. Therefore I wanted to not do anything to make it look taller. Vertical stripes make things look taller, horizontal stripes would make it look shorter proportionately, solid would be neutral in effect. 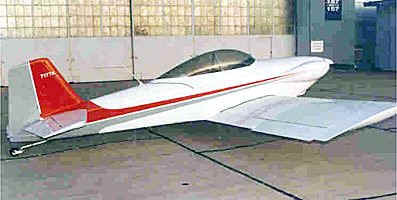 Here's an RV-4 in the traditional scheme. There are many RV-4s (and -6s) out there with derivations of this basic scheme. I don't know who started it because none of the Van's demo planes are painted this way. Sorry, I don't know who owns this particular aircraft. Decision: Ok, after much thought and advice from other builder's I trust, I decided on Option #2. Time to start the painting process! To begin the learning process I researched paint materials and techniques thoroughly. 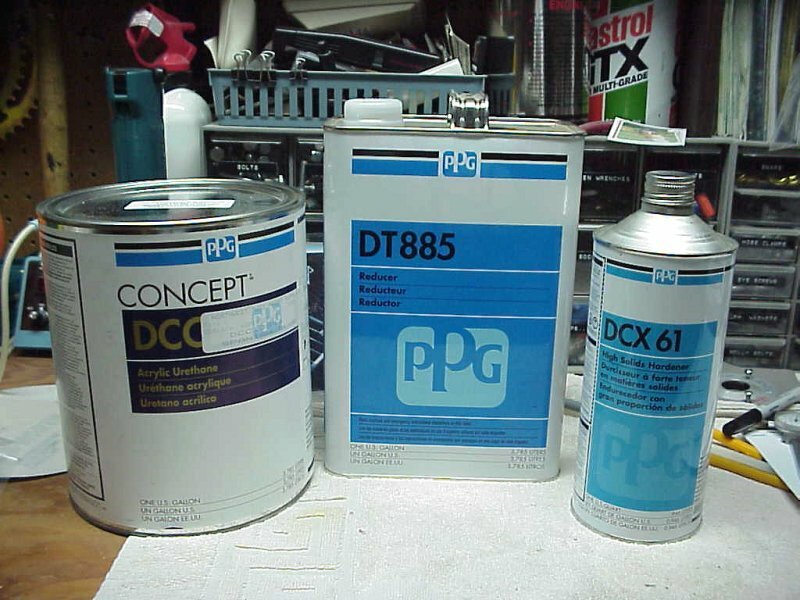 I chose PPG Concept (aka DCC), an acrylic urethane, as the paint. I shot the interior with Concept due to it's durability, but also to learn more about how to work with the materials before I got to the exterior. I was pleased with the way the interior turned out and therefore optimistic (foolish?) about the exterior. 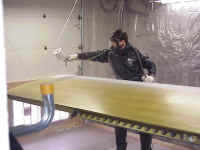 Without a professional filtered-air paint booth I knew there was no way I could keep the surface free from dirt, dust, and bugs, but I was prepared to wet-sand and buff all surfaces. Concept supposedly lends itself well to this and yields a mirror smooth surface as a reward for the effort, however I later learned that I wanted to avoid sanding/buffing if possible, not only is it more work, but you will never recapture that virgin wet look once you sand/buff. Of course anyone who's done any painting knows that the actual painting process is a relatively small part of the whole thing. Good surface prep work is essential to a good paint job, and let me tell you, surface prep is a lot of work. 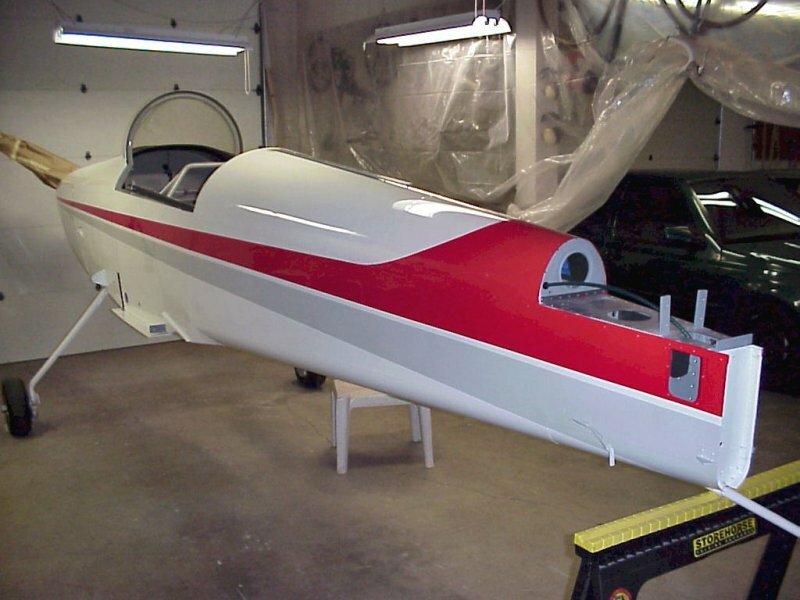 The fiberglass parts are of course more work than the aluminum, but then that's another story. 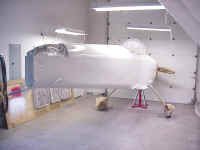 This is the primer that I used for all the fiberglass parts. K38 is relatively new and is intended to replace K36, which is fairly well known. 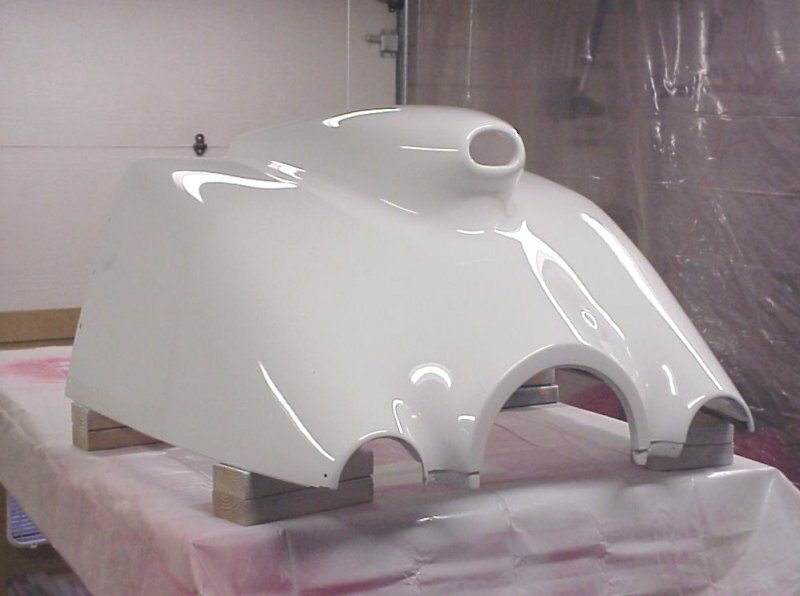 It is a high-build acrylic urethane primer and can be shot directly over properly prepared aluminum or fiberglass. 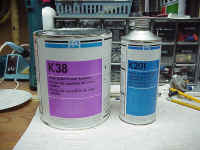 It is mixed 4-1 with K201 catalyst/hardener. It works very well, I highly recommend it. It shoots very easily, dries reasonably quickly between coats, and sands easily. One thing though, I would dedicate an older gun to it - because of it's high-solids content is really can clog things up. It's so easy to shoot that you don't need your best gun for it. I ended up dedicating my $39.99 HVLP gun that I got from Harbor Freight Tools. to this use. 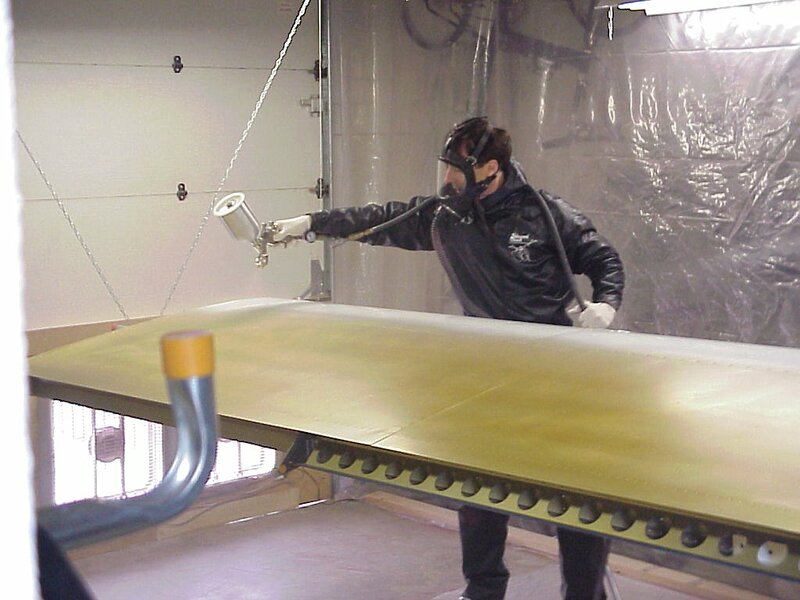 Aluminum surfaces will be given "tooth" with Scotchbrite pads, cleaned, and then primed with DX1791 self-etching wash primer. 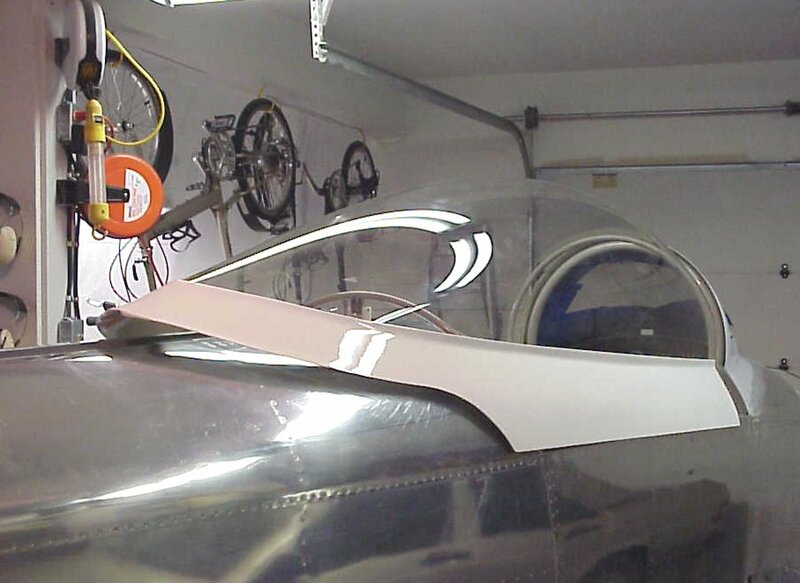 I have already shot some test samples of of this and if I had it to build the airframe over again I would have used it to prime the inside of the airplane. I primed the airframe with Sherwin Williams P60-G2 which is what Van's recommends and also uses on the Quickbuild kits. The DX1791 leaves a golden translucent finish that looks nicer than the SW and also has a nicer semi-gloss finish to it. 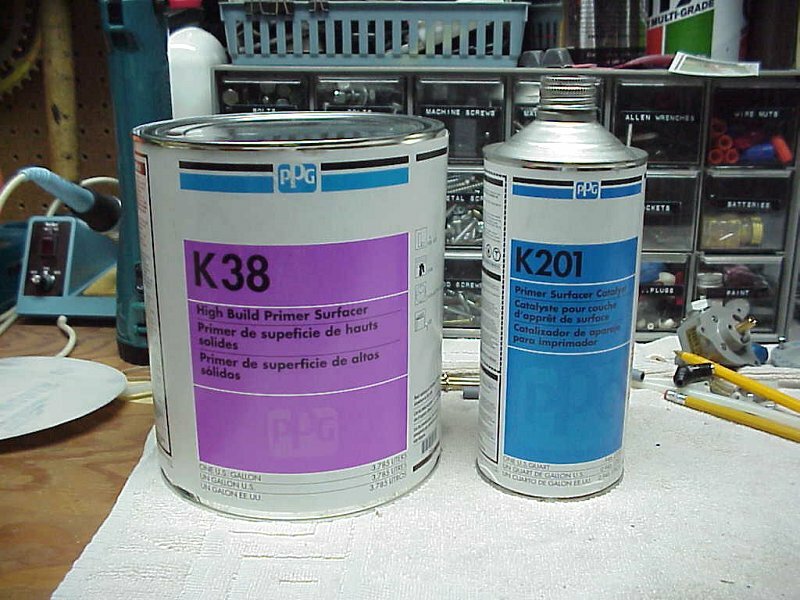 The actual paint is mixed 4-2-1 with paint, reducer, and hardener. There are four different reducers to choose from depending on the temperature of your painting environment and how fast you want it to set up... for large surfaces you intentionally want a slow reducer so entire surface flows out together. Many folks have asked for my paint color codes, so I've listed them below. I get many comments in particular on the red. It is quite a bit more intense than reds typically used. In the process of selecting my colors by testing small samples, and not liking several of them, I learned that virtually all reds are really blends of red color base with various amounts of black, blue, and yellow added to product different tints. None of the samples I tried were really what I was looking for. 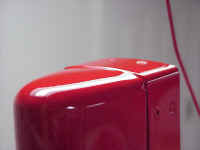 Finally, one of the guys in the paint shop suggested just shooting the red color base. I wasn't aware this was possible, but he explained that the color base is the regular paint formula that's used as a starting point for blending all colors in that hue. I tested it and it was exactly what I was looking for. I also get asked about paint quantity. Overall I used nearly three gallons of paint for the exterior: just about 2 gallons of white, 2 quarts of red, and about a cup and a half of the gray. I'm sure you could get by with less paint, but once into the painting process I realized that I needed 3 coats in most places for the type of finish I was after and that drove the quantity up a bit. If you're going to paint you need a place to do it. Our house has a 3rd garage space designed for a motorhome — higher ceiling and almost two cars deep. This has been my "aircraft construction facility" since the beginning, and I've occasionally used one of the other bays as well. While not ideal as a paint booth, I've managed to make it work so far. I took apart one of my Van's crates and put the wood back together in the form of this spacer for the bottom of the garage door. I then cut holes and mounted those box fans that every discount store has for $16.99. Air comes in from a window about half way back in the space. It would be ideal to have the door at the other end thus creating a complete cross-flow, but hey, you gotta work with what you have. 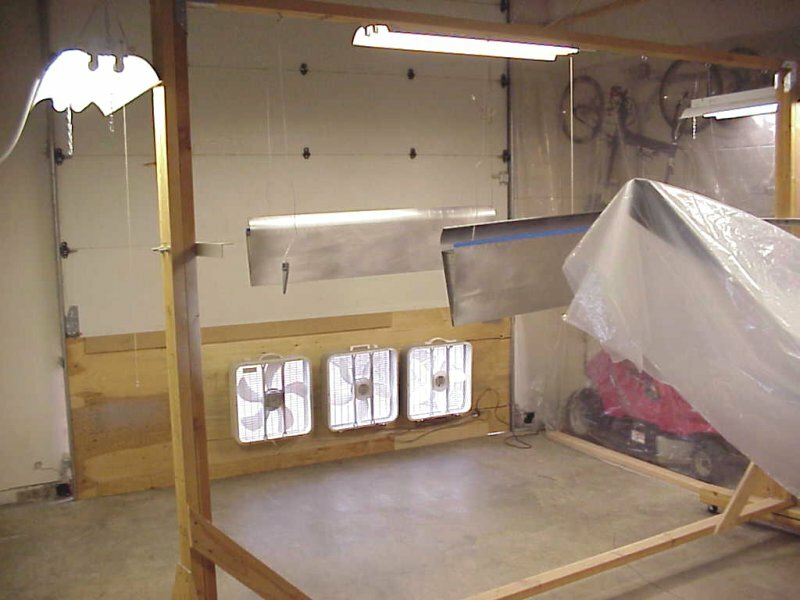 I hung heavy visqueen to seal off the construction bay (aka paint booth) from the rest of the garage, and to form a bit of a tunnel through which the fans would keep the air moving. It works ok under the circumstances. I started off with just two fans and this moved enough air for smaller parts. 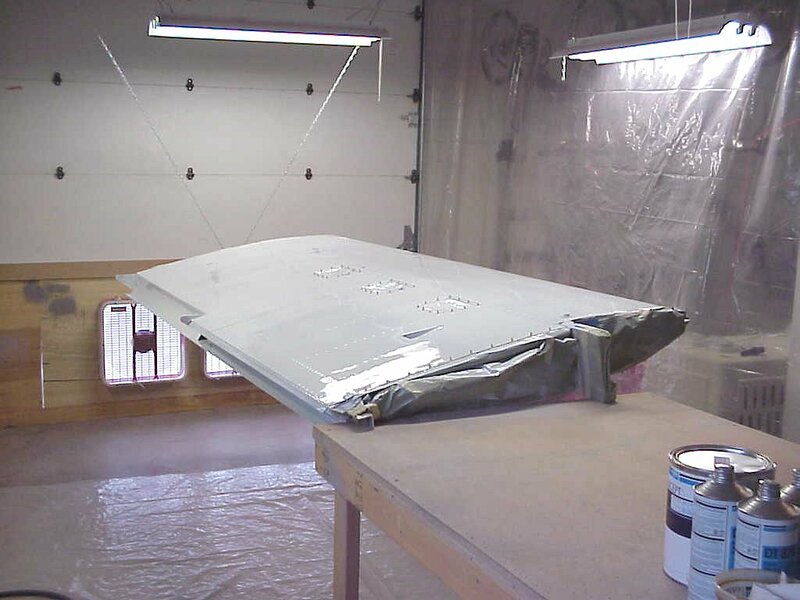 But as I've gotten into the larger parts and am spraying more paint I find I need to move more air if I don't want a thin layer of paint all over everything else in the garage. Recently I bought two more fans. The first has been mounted, and it helps, but I will need to finish by adding the fourth. 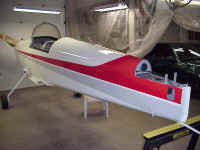 This should move enough air to do the wings and fuselage... we'll see. Here is the first gun I bought. 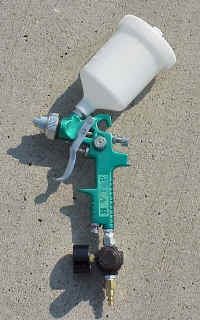 It's a gravity feed HVLP conversion gun from Harbor Freight Tools, their part number 3808. I bought it on sale for $39.99. This is an incredible value and an amazing gun for the price. 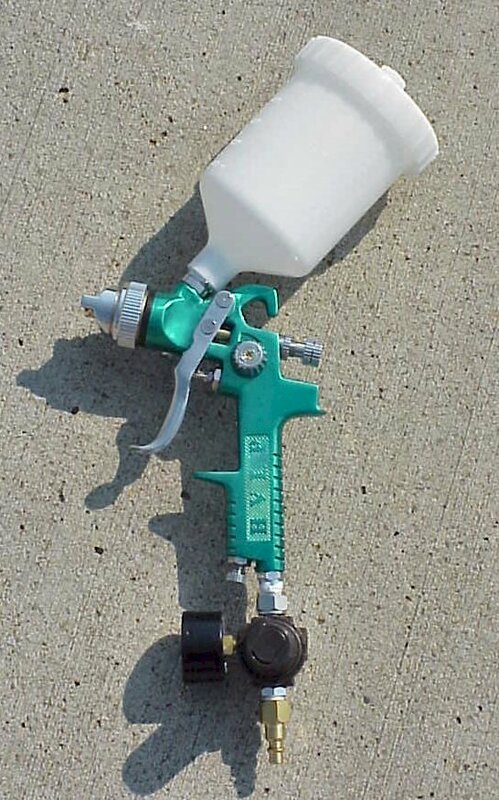 You could easily shoot your entire project with this gun, but it seemed especially appropriate to dedicate as a primer gun. In the later stages of my fiberglass work I was shooting lots of K38 which does tend to clog up things a bit. In the early stages of the project I shot wash primer with it, but later dedicated this gun to K38 and then shot all wash primer and paint with the new DeVilbiss gun below. I bought this DeVilbiss GTi-600 primarily for the bladder system. 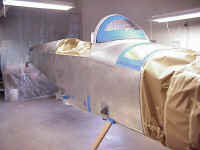 I didn't know how I was going to paint parts of the interior or the bottom of the fuselage without it. This was a wise purchase... this gun is a gem. It shoots well, is easy to adjust, is easy to clean, and has the bladder system for inverted painting whenever you need it. 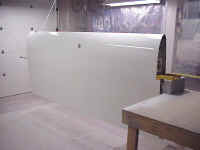 All painting starts with priming. The first exterior parts to get primed were the cowling, spinner, and empennage fairing. They will get multiple coats of K38 with lots of sanding in between. 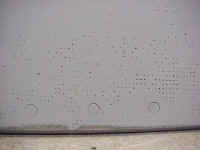 Wow, check out these pinholes — the first coat of primer exposed pinholes everywhere! 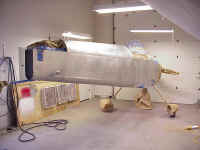 You can't see these (at least I couldn't) before shooting the first coat of primer. 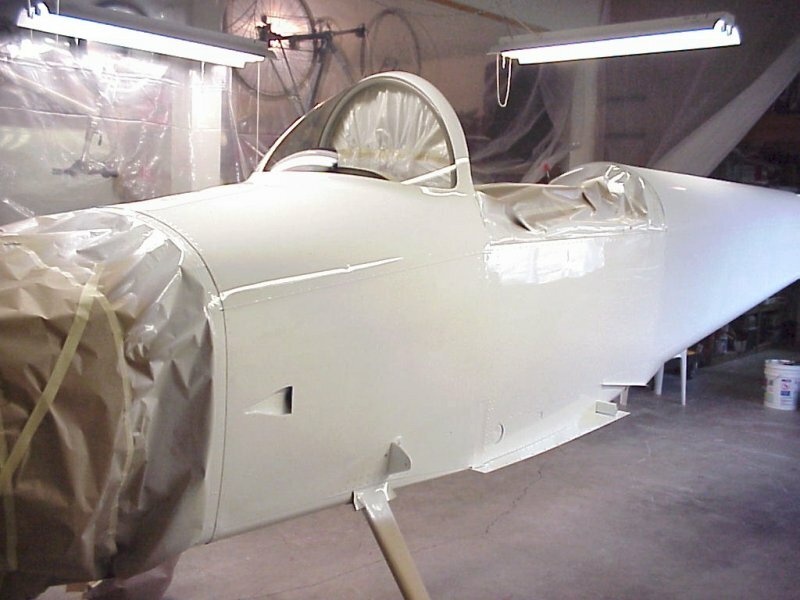 This may be due to the fact that my cowling has no gelcoat, but it sure looked smooth to the naked eye. Obviously it's not! This means some filler, more sanding, more coats of K38, and more sanding again. Fun! 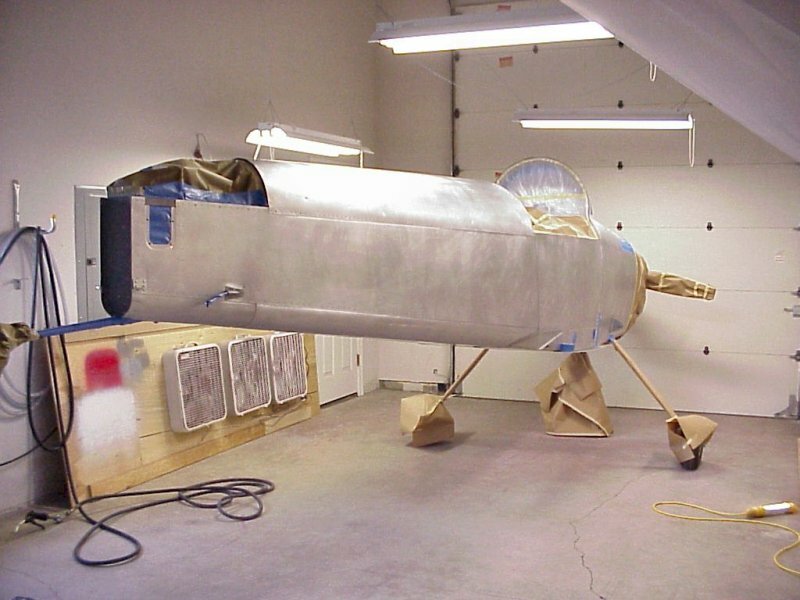 On October 8th, 2000, the exterior painting process began. 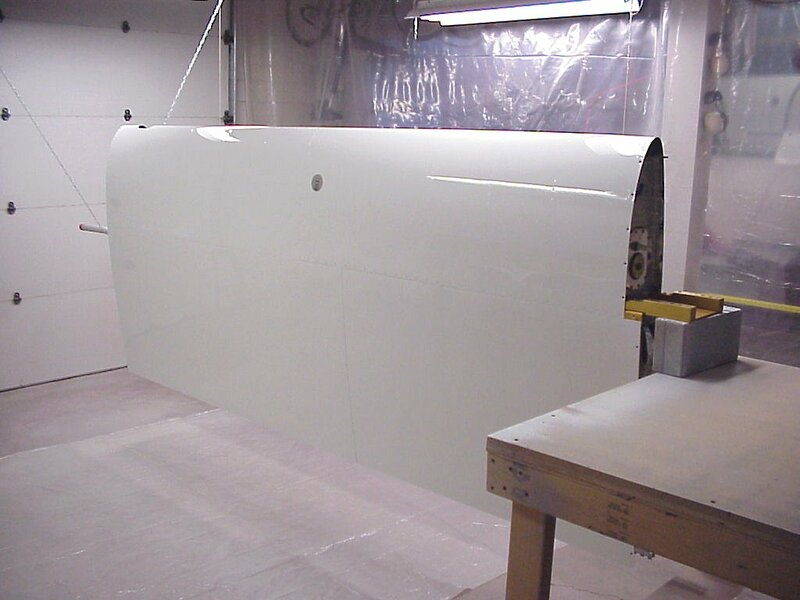 Here I am, having already scuffed, cleaned, and primed my ailerons and baggage door, nervously about to begin shooting white Concept on a real piece of the plane that people will actually be looking at. Whew, they ended up turning out great, or at least good enough for me. They did take more paint than I expected. I intended to shoot a "tack coat", then two medium coats. This was based on what I could glean from other's experience on the RV List, what is indicated on the Concept product sheet, and my experience shooting the interior. I shot the tack coat, then a coat that was probably lighter than it should have been because I was afraid I'd run it. Then I put on a medium wet coat and took a look... still a bit thin. So I waited 20 minutes, which is slightly longer than called for on the data sheet, and shot another very wet coat — I figured these parts were easy to sand any runs off, so I put a lot of paint on, trying to sneak up on that fine line between orange peel and runs in search of that elusive glossy flooded coat. 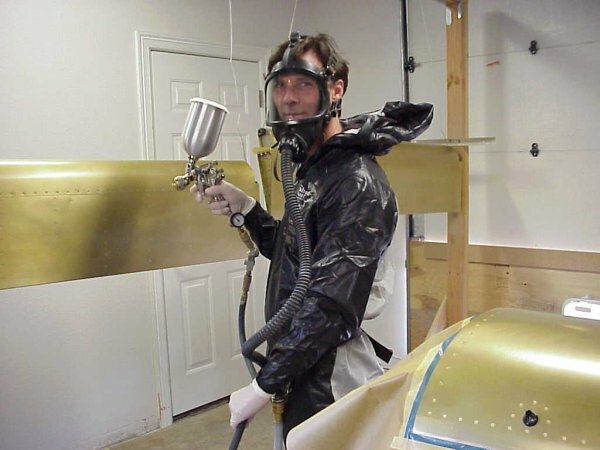 You can see I'm wearing a nylon paint suit and a Hobby Air fresh air respirator. I learned the hard way to get something decent to wear. 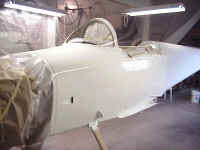 I started painting the interior with one of those cheap fiber suits I got at the autobody supply place. The first use was fine, but then it started wearing and shedding fibers all over. By the third or fourth use it was really making a mess. This suit is called a Shoot Suit and cost about $45. It is nylon, can't shed, and is machine washable. If you are shooting anything with "urethane" in it you want some sort of a fresh air respirator. 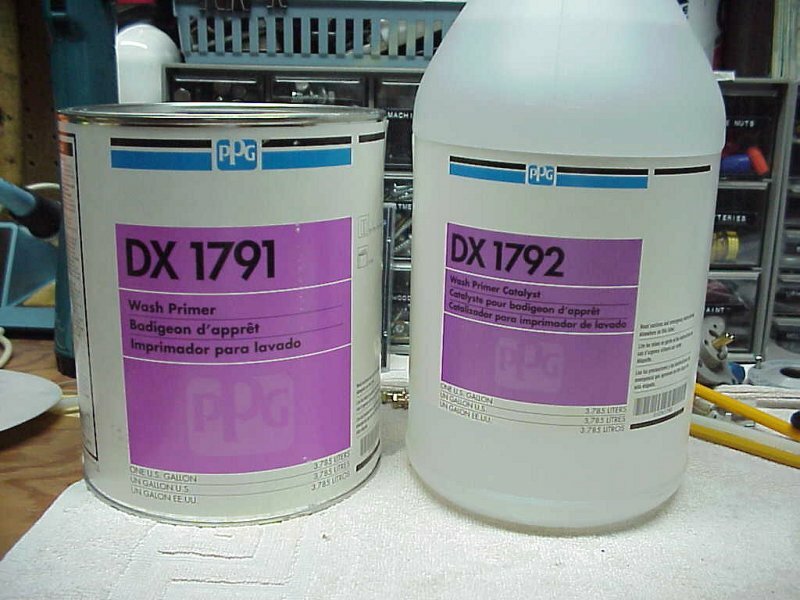 These paints contain isocyanates which are very nasty. 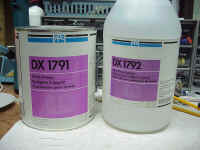 The normal passive respirators which do a fine job on organic solvents will not stop isocyanates. Be careful! Wow, what a feeling, the first parts actually turned out pretty good! There is still just a bit of orange peel, but no runs and pretty good gloss. 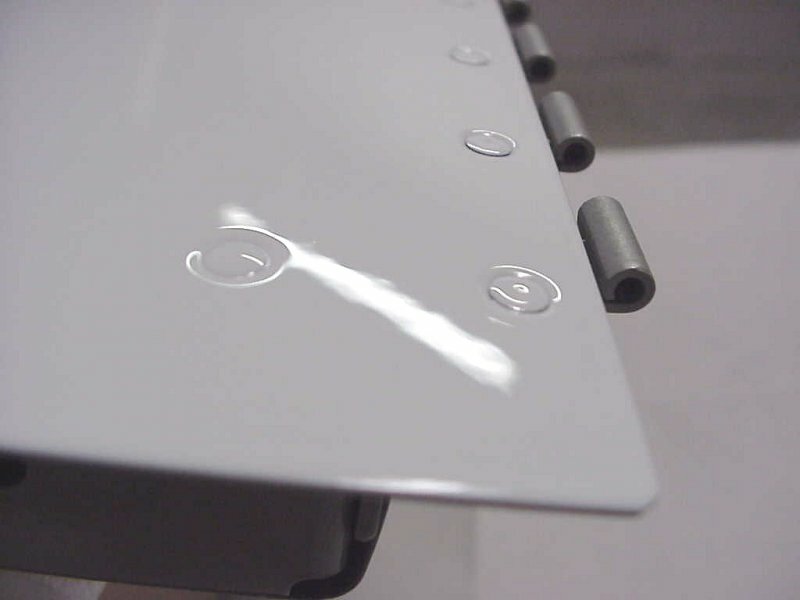 The right hand pic shows how the rivets look after three coats. 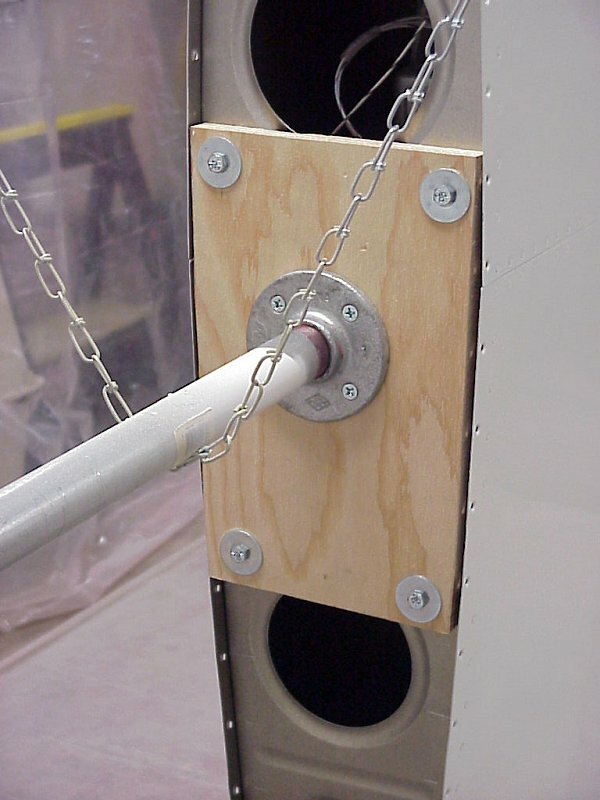 Some have "bridged" while the others on the row by the hinge still have a gap between the head and the dimple. With just two coats plus a tack coat they were all like this. Going to the third coat got about half of them filled in. The paint is fairly thick now so I didn't want to risk a fourth coat. After spending a fair amount of time priming and eliminating the dreaded pinholes in the elevator and rudder tips it was time to shoot them. These parts looked pretty good after two coats, so in spite of putting three coats on all parts I had shot with white previously, I stopped at two coats. 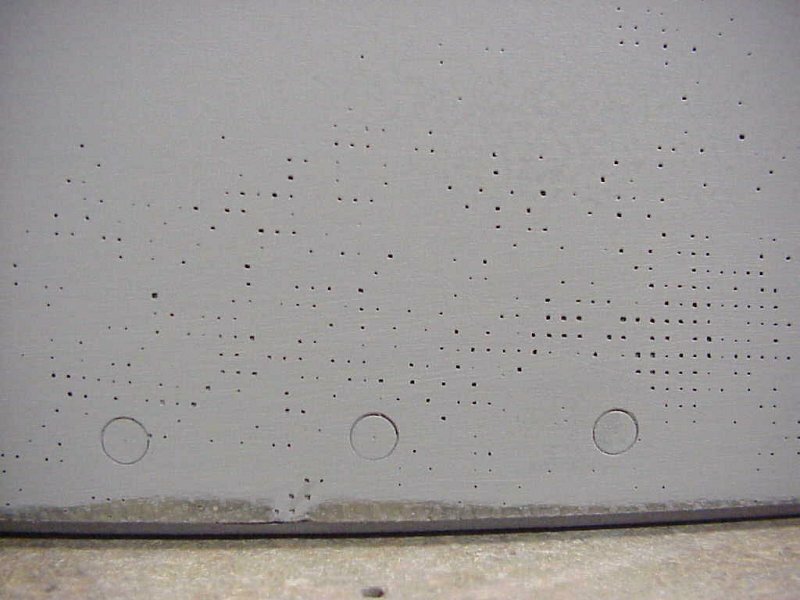 This was a mistake - none of the rivets filled in and it just generally didn't look as thick and rich as it does with three coats. Lesson learned. The canopy skirt was finished next. The porous epoxy prepreg took one coat of UV Smooth Prime which I applied with a small foam roller, then two applications of PPG K38 high-fill primer. Each application of K38 was 2-4 coats, sanded almost all the way off in between applications. 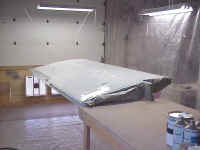 After the last application sand just through the surface with 320 or 400 grit, then you're ready to paint. So far I've learned that horizontal surfaces attract quite a bit more dirt and debris in my makeshift paint booth than do vertical ones. On the other hand it's easier to let the paint flow out and eliminate orange peel and runs with a horizontal surface. 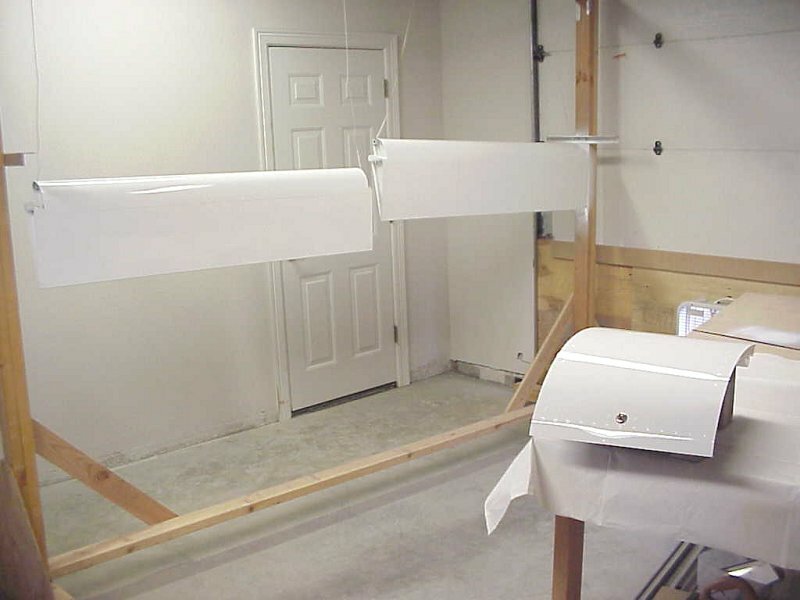 I had planned on painting my wings vertically on the storage stand that I built, but changed my mind at the last minute and jigged them horizontally. I figured they were too prominent to end up with an orange peeled surface. Runs would not be becoming either. The small dirt and fiber specs could be sanded and buffed later if it bothered my that much. As I figured out earlier, I used three coats of paint to fill in as many rivet heads as possible, and also to give me enough material there to sand out any imperfections later. At this point I have decided that I won't even worry about the flaws now. 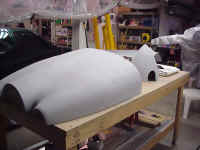 Once the parts are on the airplane they can be sanded more easily, and I can do it as time allows. None of my parts so far look what I would consider terrible in spite of the flaws. I had some sags in the leading edge which I could get to flatten out by orienting the wing properly. About a half hour after shooting the left wing I oriented it vertically to flatten the sags and keep more dirt from landing on it. This is how I jigged the end of the wing to rest in the chain cradle. 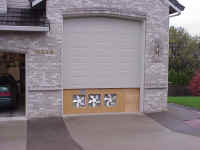 The chain was attached to the garage door tracks by drilling holes in the edge. An added benefit of suspending at least one end is that you can move your hoses around without catching on tables or stands. I never thought I'd see the day when this cowl would actually look like something. With all the cutting, fiberglassing, sanding, filling, and more sanding, I'm kind of stunned that it's done and actually looks ok. Note the trick support system: no support in the back at all which enabled me to move my air and respirator hoses back and forth underneath the plane without them catching on anything. I have a hydraulic wing jack supporting the carburetor in the front which let's me adjust the fuselage at any angle I want by simply jacking it up or down... worked great! 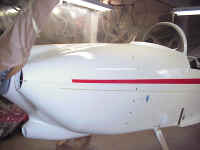 ...the fuselage after. The fuselage was tough to shoot. Why? Large areas are tough to get an even coat on, light is always a challenge, and the combination of horizontal and vertical surfaces is difficult to balance between orange peel and runs. Then there's laying on your back to paint the bottom. I used a fluorescent trouble light to see what I was doing and just laid on my back and sprayed away. Actually the bottom is easy to shoot... it gets very few dirt particles in it, and you can load the paint on for a nicely flooded coat and it won't run because it's horizontal. Using a slow reducer is the only way to get all the surfaces on a large object such as this to blend together, but then of course you are more prone to runs, which I got a few of. This reinforces my decision to use Concept in a non-metallic color... they're relatively easy to sand and buff out! 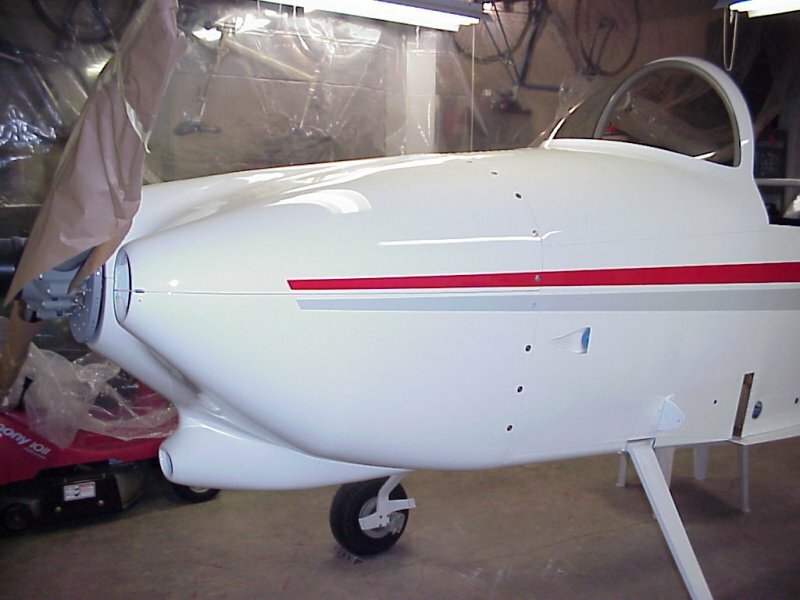 Now it's on to the fuselage trim colors — new territory for me. Looks much better with the gray, don't you think? Drying - I found the times to be fairly close to what the data sheets say. Now "drying" is a relative term. 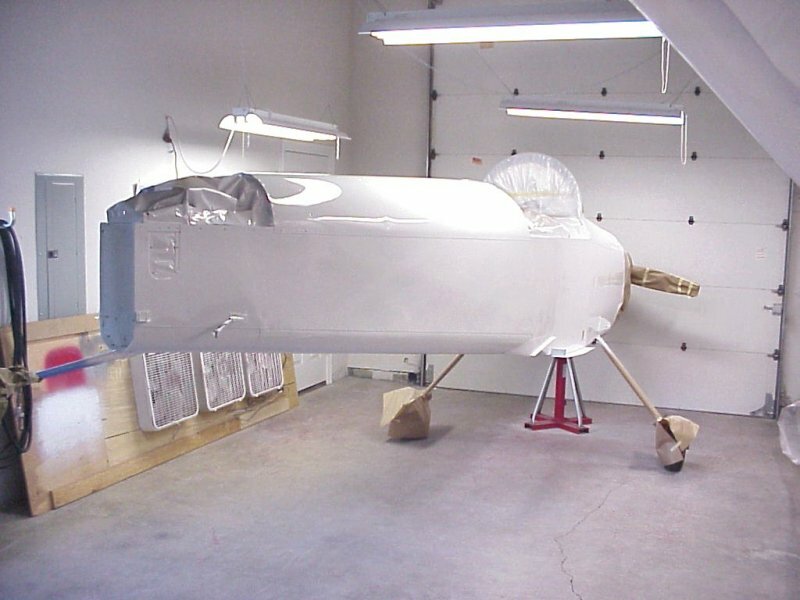 A urethane paint both dries in the sense that the thinners evaporate, and cures in that a chemical reaction takes place which hardens the paint. I make second coats in temps cooler than 70 after 15-20 minutes which I found to be just about right. Too soon and the risk of a sag goes up, too late and it won't chemically bond. Orange peel - You will find that the controlling the orientation of your surfaces will help. Anything horizontal can be made to flow nicely without orange peel, but you will pick up more dust and dirt. 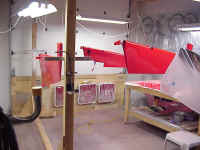 Vertical surfaces won't pick up much dirt, but eliminating the orange peel without inducing runs in very very difficult. Even in the best of conditions I'd say that total elimination of orange peel while shooting a vertical surface is just about impossible. Temperature - I shot much of my pieces in 40 degree temps and it really worked fine. It did take a bit longer to set up, and I used faster reducer, but it was surprisingly temperature tolerant. Go to the Picture Gallery for pics of the finished product.